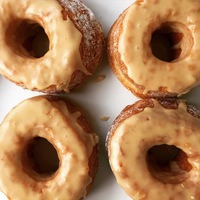 This is a nice Gourmet maple Donut. No donut is complete for a base without Zeppola and yellow cake. Flv Caramel : This is a rich caramel flavor that makes it have a nice taste. Flv Frosting adds a nice bit of that sweet frosting taste. Flv Milk and Honey gives a rich Carmel like flavor to the recipe with bold undertones of coffee and caramel. TFA Bavarian Cream gives the recipe a nice vanilla flavor while adding body to the recipe. Mixed at 60/40. This recipe needs about 1 week steep time for its full poetential of flavor to meld together.